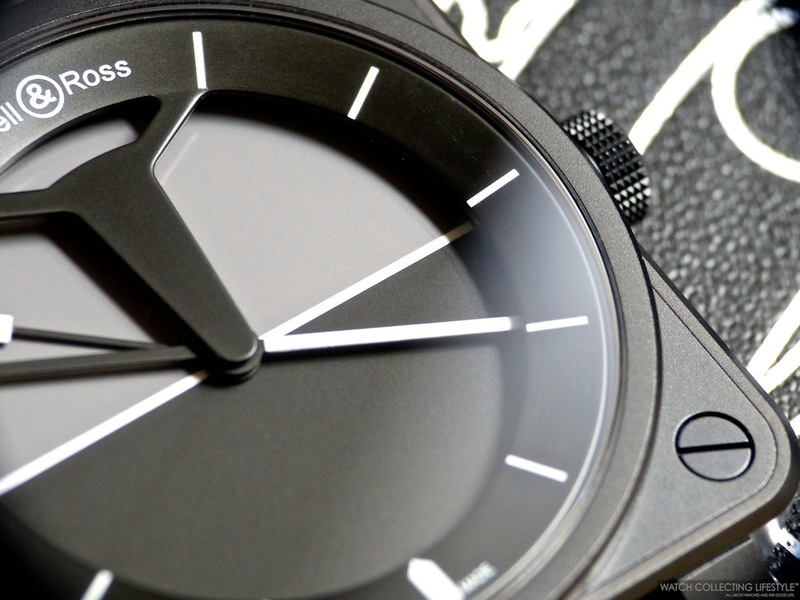 Baselworld 2019: Bell & Ross BR-X1 R.S. 19 Chronograph. Live Pictures & Price. Continuing with their partnership with the F1 Renault team, Bell & Ross presented the BR-X1 R.S. 19 Chronograph along with three other Renault Chronographs during Baselworld 2019 to mark the fourth year of involvement with this racing team. 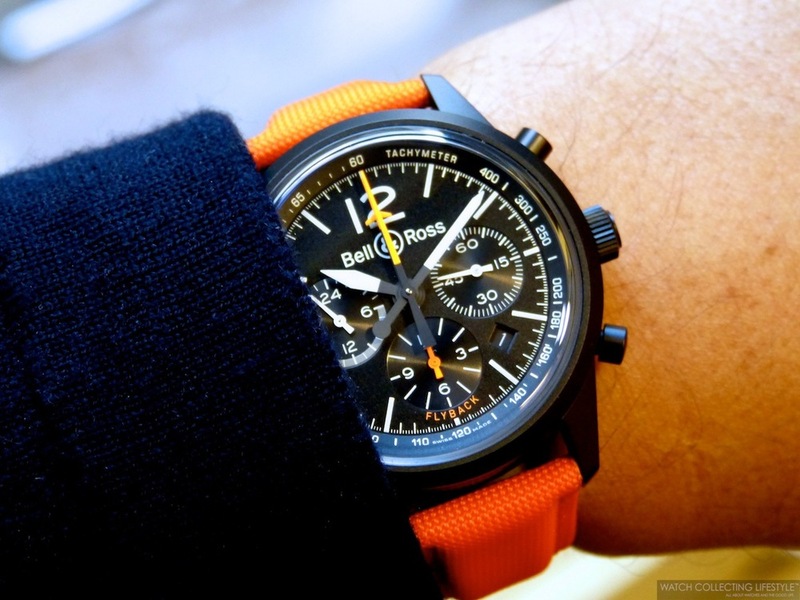 The new Bell & Ross BR-X1 R.S. 19 is an absolute racing inspired machine that brings the magic of an F1 racing car into a timepiece. Available in a limited edition of 250 pieces this skeletonized chronograph charged with the Renault team yellow racing color is for sure going to be a success. Posted on March 28, 2019 by Editor & Publisher and filed under Baselworld, Baselworld 2019, Bell & Ross and tagged Bell & Ross Bell & Ross BR-X1 R.S. 19 Chronograph Chronographs 2019 Baselworld Baselworld 2019 F1 Renault Team Watch Bell & Ross BR-X1 R.S. 19 Chronograph Renault Team Most Popular. 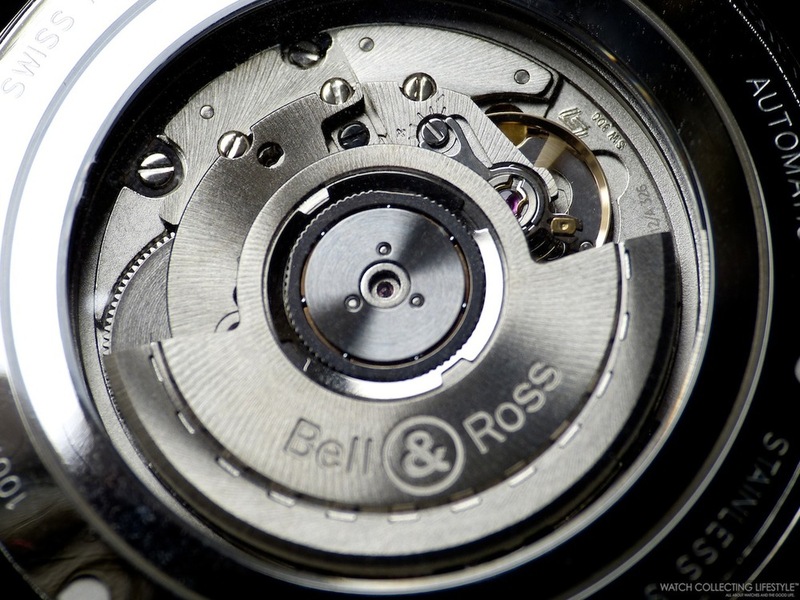 Insider: Bell & Ross BR-X2 Tourbillon Micro Rotor. Hands-on with a 99-Piece Limited Edition. In a limited edition of 99 pieces comes the Bell & Ross BR-X2 Tourbillon Micro Rotor ref. BRX2-MRTB-ST. Following the trend set by brands like Richard Mille, Greubel Forsey, MB&F and Hublot, Bell & Ross first released their BR-X1 Tourbillon Sapphire priced at a whopping almost half a million dollars in order to play within a much higher price point in the market. As a sequel to the BR-X1, Bell & Ross released the BR-X2 Tourbillon Micro Rotor —also available in a fully skeletonized version— at a much more affordable price point but sill way too high for what anyone would be willing to pay for a Bell & Ross. Posted on December 26, 2018 by Editor & Publisher and filed under Bell & Ross and tagged BR-X2 Tourbillon Micro Rotor Bell & Ross BR-X2 Tourbillon Micro Rotor Bell & Ross Tourbillons Mainstream Brands Entry Level Brands Most Popular. Insider: Bell & Ross BR V2-94 Garde-Côtes. A Gorgeous Watch That Won't Break the Bank. Last time we talked here at WCL about Bell & Ross was back in 2017 when the brand had just released its BR-X1 Tourbillon Sapphire —you can read our review here. Disappointed by seeing the brand trying too hard to conquer uncharted territory in a price point that doesn’t match their brand essence and product offering, we decided to take a hiatus at reviewing any of their watches. However, with the release of the BR V2-94 Garde-Côtes, the brand picked our interest one more time by going back to their basics and what they’re well known for, making good looking watches that won’t break the bank and that give you a little bit more than a TAG Heuer, a Longines or a Baume & Mercier would give you just to name a few. Posted on November 19, 2018 by Editor & Publisher and filed under Bell & Ross and tagged Bell & Ross BR V2-94 Garde-Côtes Bell & Ross Chronographs 2018 Bell & Ross Garde-Côtes Mainstream Brands Most Popular. Insider: Bell & Ross BR-X1 Tourbillon Sapphire. Hands-on with the Almost Half Million Dollars 8-Piece Limited Edition. Following the trend set by brands like Richard Mille, Greubel Forsey, MB&F and Hublot, comes the Bell & Ross BR-X1 Tourbillon Sapphire. This new sapphire watch released by Bell & Ross during Baselworld 2017 was a big surprise, considering that the price point for their timepieces has always been under $8K and with just a few misfits highly priced in the $20K price range. Furthermore, an almost half million US dollars timepiece that is not even powered by an in-house calibre should be something even out of the question. Posted on August 7, 2017 by Editor & Publisher and filed under Bell & Ross and tagged Bell & Ross BR-X1 Tourbillon Sapphire Bell & Ross Tourbillons Mainstream Brands 2017 Sapphire Bell & Ross Most Popular. 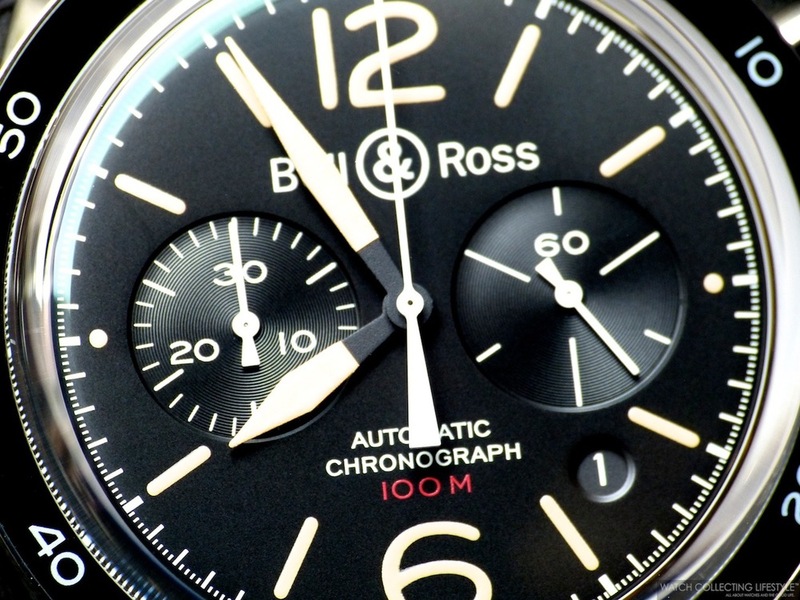 News: Introducing the Bell & Ross BR 01 Skull Bronze Limited Edition. Hands-On Live Pictures and Pricing. In 2009, Bell & Ross made a lasting impression by breaking with traditional watchmaking codes with its first "Skull" BR 01. This year, the brand presents a surprising variant in a limited edition of 500 pieces. The new Bell & Ross BR 01 Skull Bronze —the inspiration for the Bell & Ross Skull Tourbillon for ONLY Watch auction— with its distinctive character, pays tribute to the epic of the parachutists of the Second World War. On their jumpsuits, these elite fighters proudly wore a crest bearing a skull and these words: "Death from Above". Falling from the sky at dawn on June 6, 1944, the troops of the 101st and 82nd American airborne divisions played a vital role in the Normandy landings. From time immemorial, the most formidable fighters have shown their courage by sporting such skulls, both to intimidate their adversaries and to ward off bad fortune. Today, while it continues to figure on a lot of military equipment —such as uniforms, emblems and even airplanes—, the famous "Jolly Roger" as decorative element appears as a talisman or a rebel symbol. Posted on September 29, 2015 by Editor & Publisher and filed under Bell & Ross, News and tagged Bell & Ross BR01 Skull Bronze Bronze Watch Bronze Bell & Ross Halloween. Insider: Bell & Ross Grande Date WW1-96. Vintage Looking, Superb Sunburst Dial and a Big Date. Bruno Belamich—Bell— and Carlos A. Rosillo—Ross—, two boyhood friends, formed the Bell & Ross brand in 1993. Known for its iconic aesthetics with their oversized watches and distinctive easy-to-read dials, Bell & Ross continues to position itself as a strong player in the watch collecting arena. 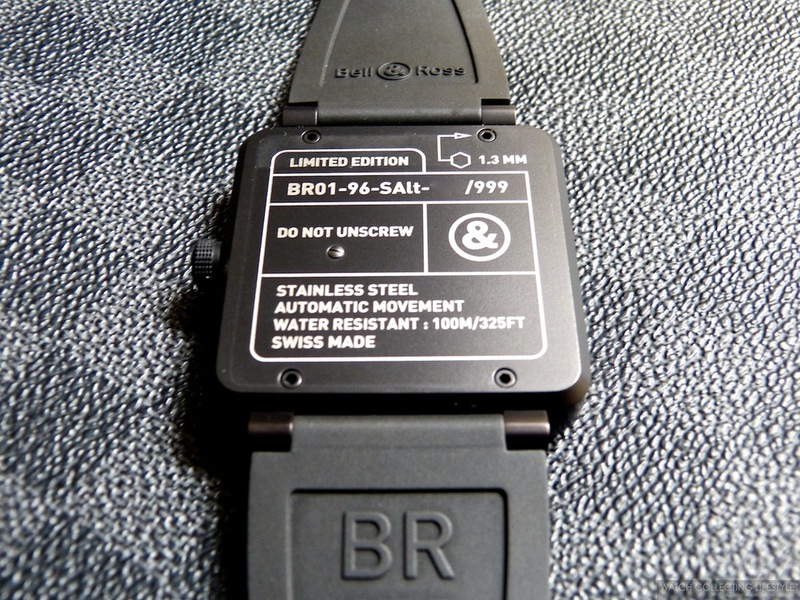 Their BR01 instrument series, perhaps the most popular within the brand collection, was based on airplane cockpit instruments. The BR WW1-96 is part of the Vintage series and is reminiscent of the first pilot watches of the 1920s and designed to resemble the look of a pocket watch but on a strap. This beautiful watch comes fitted with a black alligator strap and a massive 45mm stainless steel case that wears nicely and comfortably for a watch of this size. The sunburst dial on this timepiece is just magnificent. At first glance, it appears to be jet black; however, upon closer inspection and while exposing the watch to a bright source of light—especially natural light— you get the mesmerizing effect of its sunburst finished dial in charcoal gray. Posted on August 4, 2015 by Editor & Publisher and filed under Bell & Ross and tagged Bell & Ross Grande Date WW1-96 Sunburst Dial Bell & Ross Vintage Pocket Watch Series Posts 2013.
Insider: Introducing the Bell & Ross BR-X1 Carbone Forgé Limited Edition. A Forged Carbon Case as Good as it Gets. Always ahead of its time, Bell & Ross continues to innovate this time with the launch of the new Bell & Ross BR-X1 Carbone Forgé —Forged Carbon— limited edition ref. BRX1-CE-CF-BLACK. This new sporty chronograph in a limited edition of 250 pieces, follows the exciting launch of the BR-X1 Skeleton Chronograph last year. Fitted with a stunning 45 mm forged carbon case only comparable with the forged carbon used by Audemars Piguet but with slightly more marbling —we heard through the grapevine that the French aeronautics company that worked with AP is now involved with Bell & Ross—, the new BR-X1 Carbone Forgé is simply our favorite Bell & Ross watch to date. With its revolutionary design and directly inspired by on-board flight instruments the BR-X1 line is a tribute to the Bell X-1 —the first American experimental rocket plane to break the sound barrier in 1947. 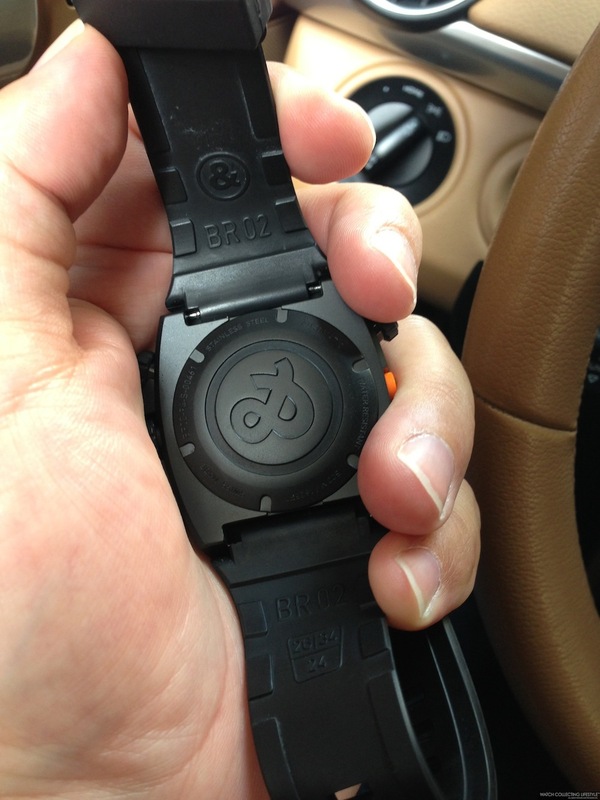 The square case of the BR-X1 is covered with a high-tech band made from ceramic and rubber. It is designed as a cover around the edges, acting as a defensive shield that protects it from possible impacts. Posted on April 27, 2015 by Editor & Publisher and filed under Bell & Ross and tagged Bell & Ross BR-X1 Skeleton Chronograph Carbon Fiber Bell & Ross BR-X1 Carbone Forgé Limited Edition Bell & Ross Forged Carbon Top Brands Most Popular. Baselworld 2015: Introducing the Bell & Ross Vintage WW1 Edición Limitada. A Watch Inspired by Cigars and Made for Cigar Lovers. Live Pictures and Pricing. Continuing with our coverage of Baselworld 2015, here we bring you our hands-on review of this new Bell & Ross Vintage WW1 Edición Limitada —Limited Edition in Spanish— limited to 99 pieces. Because time is easily forgotten when you’re enjoying yourself, Bell & Ross has chosen to equip its new Vintage WW1 Edición Limitada ref. BRWW1-GRM-PG with a movement with a 5-day power reserve with a manual wound mechanism that is armed with a double barrel. On the matte grainy tobacco brown dial, one can appreciate an exposed balance wheel at 9 o'clock and a power reserve indicator with the inscription in Spanish “Reserva de Marcha 5 días” —5-day Power Reserve. Fitted with an elegant highly polished pebble-shaped 5N 18K red gold case measuring 42 mm in diameter, the new Bell & Ross Vintage WW1 Edición Limitada exudes class and elegance, while evoking the Latin American tones that gave its inspiration. Posted on April 8, 2015 by Editor & Publisher and filed under Baselworld, Bell & Ross, News and tagged Bell & Ross WW1 Edición Limitada Baselworld 2015 Baselworld Top Baselworld. 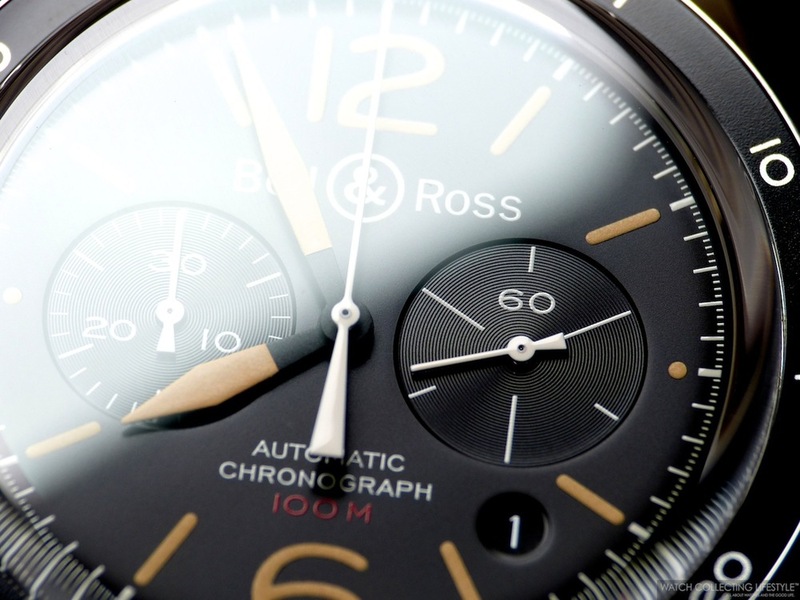 Baselworld 2015: Introducing the Bell & Ross BR01-92 10th Anniversary Limited Edition. Live Pictures and Pricing. 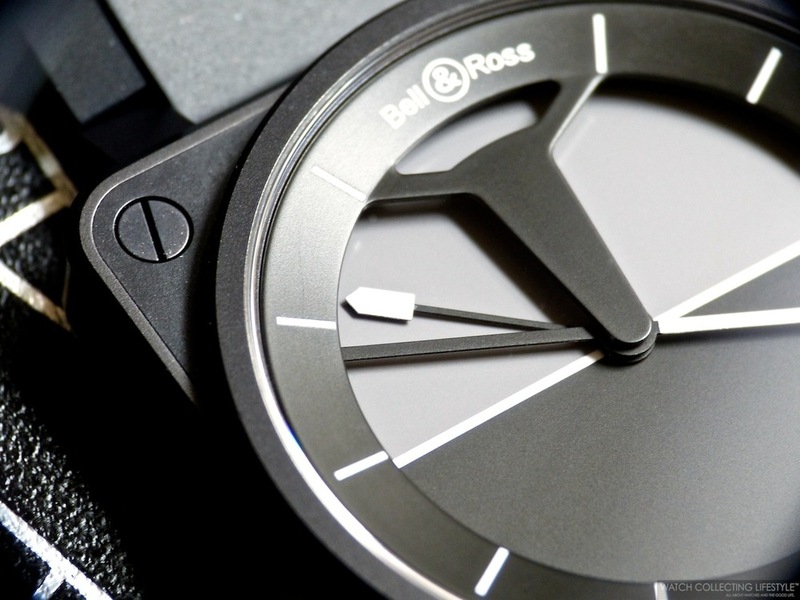 This year at Baselworld 2015, our friends from Bell & Ross presented more than twenty novelties, amongst those, a new limited edition celebrating 10 years of the iconic BR01-92 square-shaped case Bell & Ross was presented. 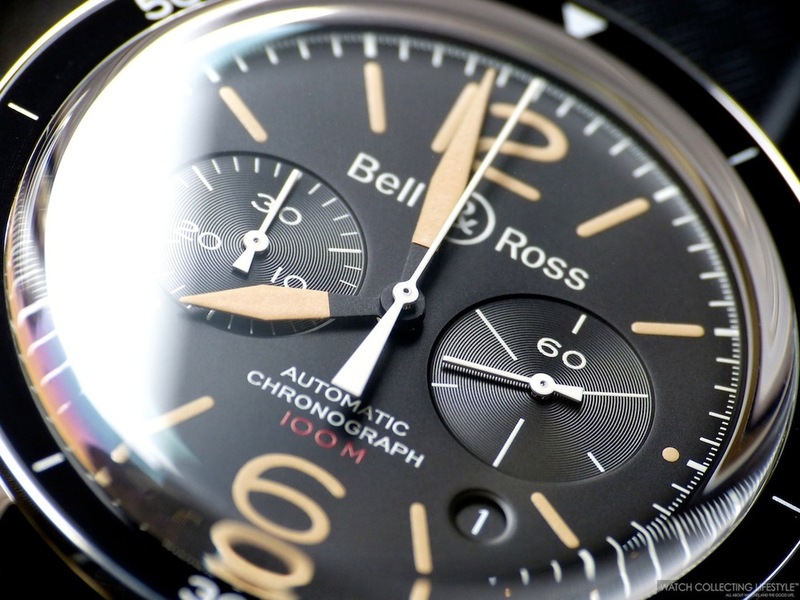 The new Bell & Ross BR01-92 10th Anniversary Limited Edition ref. 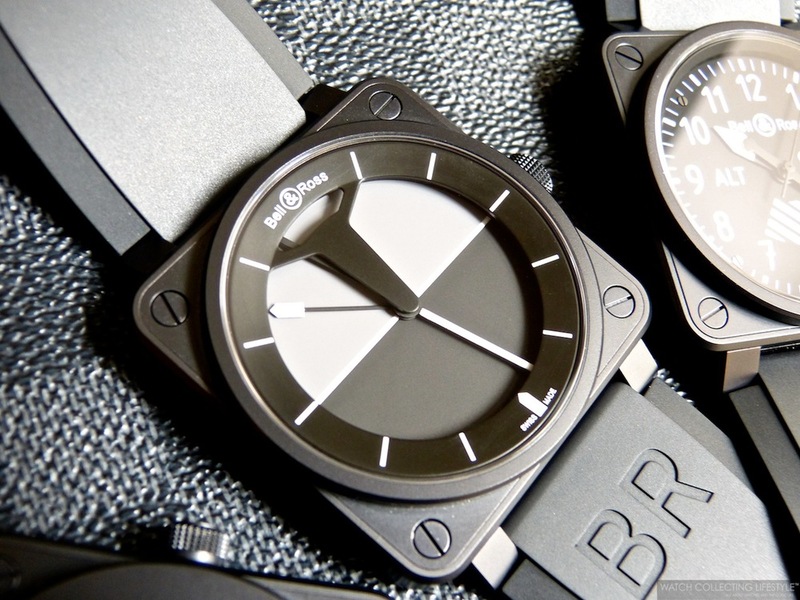 BR0192-10TH-CE pays homage to the watch that became the Bell & Ross signature watch since its launch in 2005. Fitted with a matte black ceramic case and in a limited edition of 500 pieces, this new watch is a perfect execution to celebrate such milestone. Equipped with a matte black dial with the traditional B&R layout and a small 10th anniversary medallion at 6 o'clock, the watch exudes coolness and aviation. Posted on March 30, 2015 by Editor & Publisher and filed under Bell & Ross, News, Baselworld and tagged Baselworld Baselworld 2015 Bell & Ross BR01 10th Anniversary Top Baselworld. 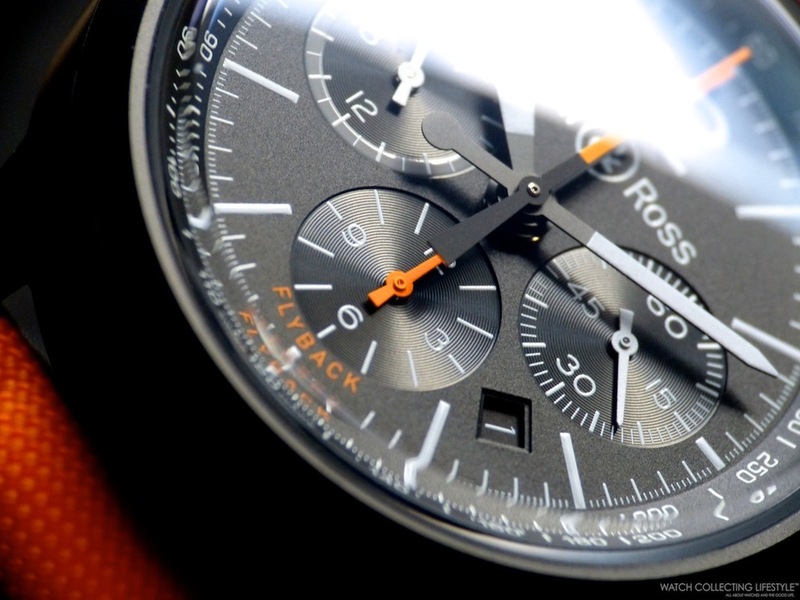 Baselworld 2015: Introducing the Bell & Ross BR 03-94 Rafale Limited Edition. Live Pictures and Pricing. Inspired by the history of aviation and its technological advances, Bell & Ross collections pay homage to the key periods in civil and military aviation from 1900 to the present day. The military world has always been a pioneer in numerous fields. Its innovations have had various applications in civilian life, such as the Internet, GPS or even the first business jets. Creating avant-arde technological ties between its civil and military activities, Dassault Aviation has acquired unquestionable expertise of the highest standard. Bell & Ross and Dassault Aviation share the same passion for aviation, which guides them in their respective creations. In 2013, to celebrate the 50th anniversary of the Falcon business jet, Bell & Ross paid homage to the civil aviation of the 1960s by presenting the Vintage Falcon model. This year, the two companies are joining forces once again to celebrate the most successful multi-role fighter aircraft on the market: the Rafale. Posted on March 20, 2015 by Editor & Publisher and filed under Baselworld, Bell & Ross, News and tagged Bell & Ross BR-03 Rafale Bell & Ross BR 03-94 Rafale Limited Edition Top Baselworld Baselworld Baselworld 2015. Rare Bird: Bell & Ross Vintage WW1 Régulateur Pink Gold. Only 99 Pieces Available and Here's One of Them. During Baselworld 2013, Bell & Ross unveiled several novelties and this coveted Vintage WW1 Régulateur in Pink Gold is one of them. The Vintage WW1 Régulateur is a limited edition watch comprised of only 99 pieces in pink gold —extremely difficult to find, but we were lucky enough to find one. A 'régulateur' a.k.a. regulator, is a watch with non-coaxial hour and minute hands, which means, that the hour and minute hands do not share the central pinion position on the dial but are independently placed. On regulators, the minute hand is traditionally the most important hand and it is typically placed on the central pinion at the center of the dial. Posted on October 20, 2014 by Editor & Publisher and filed under Bell & Ross and tagged Bell & Ross Vintage WW1 Regulateur Pink Gold Bell & Ross Pink Gold Regulator Limited Edition 99 Pieces Bell & Ross Limited Edition 99 pieces Bell & Ross Vintage WW1 Régulateur Bell & Ross Vintage WW1 Regulator in Pink Gold Posts 2013 Top Brands. News: Presenting the Bell & Ross BR-X1 Skeleton Chronograph. A Pricey Limited Edition of 250 Pieces. Always ahead of its time, Bell & Ross continues to innovate with the launch of the BR-X1 Skeleton Chronograph, a high-tech chronograph with a sporty design, which is as robust as it is sophisticated. Revolutionary in its design, the BR-X1 is the first watch of a new collection from Bell & Ross and the beginning of a whole new chapter in the saga of the brand. An extreme version of the BR-01, whose iconic square shape is directly inspired by aeronautical flight instruments, the BR-X1 is much more than a top-of-the-range contemporary sports watch. Nearly ten years ago, Bell & Ross launched the BR-01, a distinctive, high-performance watch directly inspired by on-board flight instruments. It has become an iconic watch thanks to its square shape, its round dial with perfect legibility, its broad dimensions and the efficiency of its functional design. Since then, the BR-01 has continued to evolve without losing its original identity. As a guiding principle, from vintage pocket watches to the grand complication watches, each Bell & Ross signed model pays homage to a great era in military history. Posted on October 16, 2014 by Editor & Publisher and filed under Bell & Ross, News and tagged Bell & Ross BR-X1 Skeleton Chronograph Bell & Ross BR-X1. 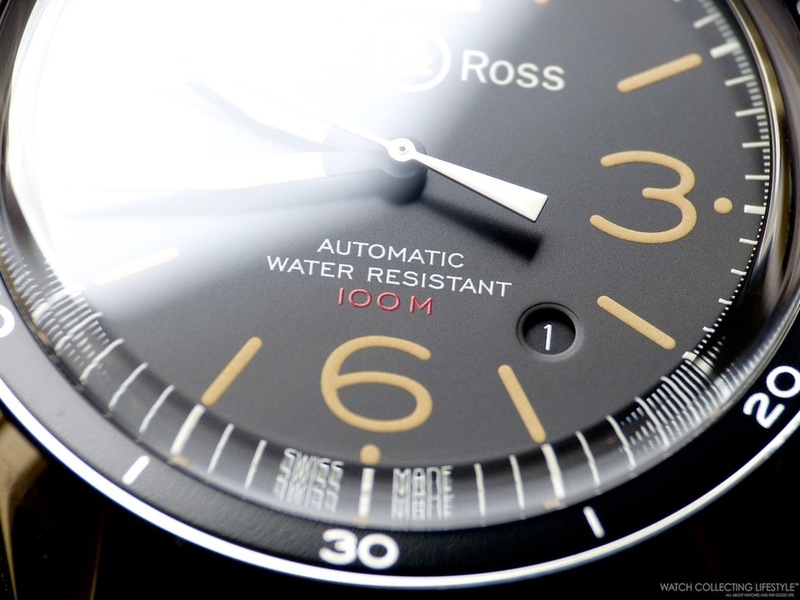 Baselworld 2014: Bell & Ross BR 126 Carbon Air Force Insignia. Live Pictures and Pricing. 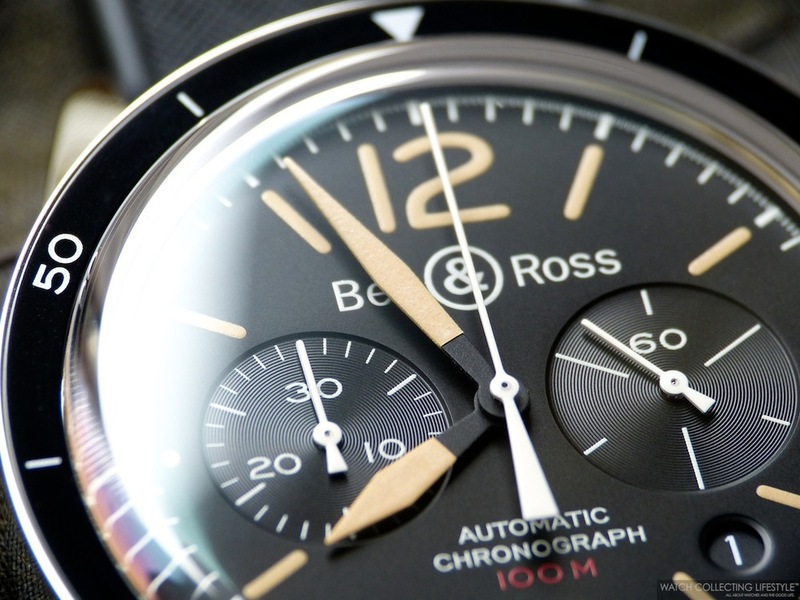 This week at Baselworld 2014, Bell & Ross presented 21 new watches across their different collections. While we will be presenting most of them here, this is the turn for the brand new Bell & Ross BR 126 Carbon Air Force Insignia. This new model, is a perfect example of the strong focus that the brand continues to give to the aviation theme. This watch features a blackened PVD stainless steel case measuring 41.6 mm in diameter, a black calfskin strap and an automatic movement with running seconds at 3, 30-minute chrono register at 9 and a date aperture between 4 and 5 o'clock. The black dial on this watch features white minute markers and the Air Force insignia at 6 o'clock. We are confident that this new model part of the Vintage BR collection will quickly become a favorite among Bell & Ross fanatics. More pictures and full review to follow. Sticker Price $4,800 USD. For more info on Bell & Ross click here. Posted on March 31, 2014 by Editor & Publisher and filed under Bell & Ross, Baselworld, News and tagged Bell & Ross BR 126 Insignia Air Force. Insider: Bell & Ross BR 126 Blackbird Limited Edition. A 500-piece Limited Edition is the Latest Addition to the Vintage Collection. The recently released Bell & Ross BR 126 Blackbird is the latest addition to the Vintage collection and a watch that pays tribute to the legendary 1960s American spy plane, the Lockheed SR-71 "Blackbird" stealth plane, whose black paint absorbed radar waves. 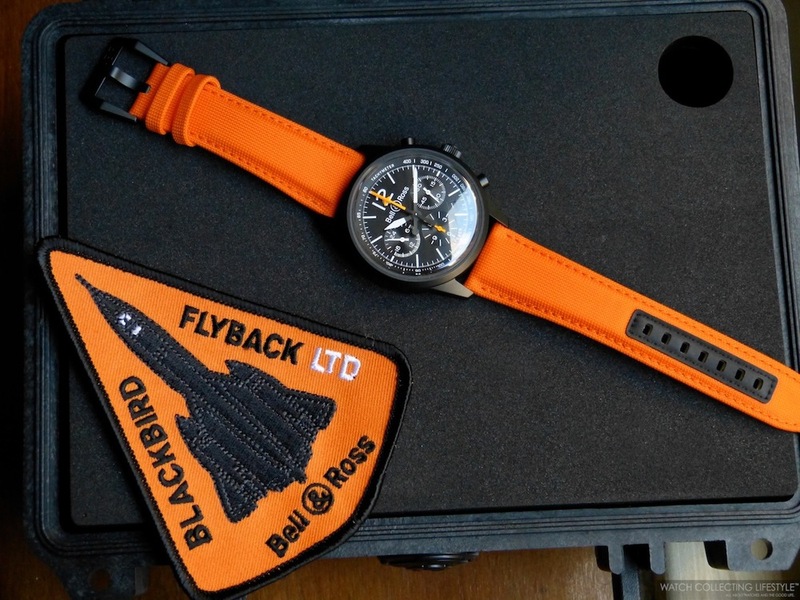 The Bell & Ross BR 126 Blackbird comes in a pelican case where the first thing that greets you way before you get to the watch is a Blackbird Flyback orange patch. The pelican case also includes a strap changing tool and an additional tropic rubber strap along with the watch. We really like when watch manufactures go the extra mile an add special packaging to a special watch in order to make it even more appealing. Kudos to Bell & Ross for this special packaging. 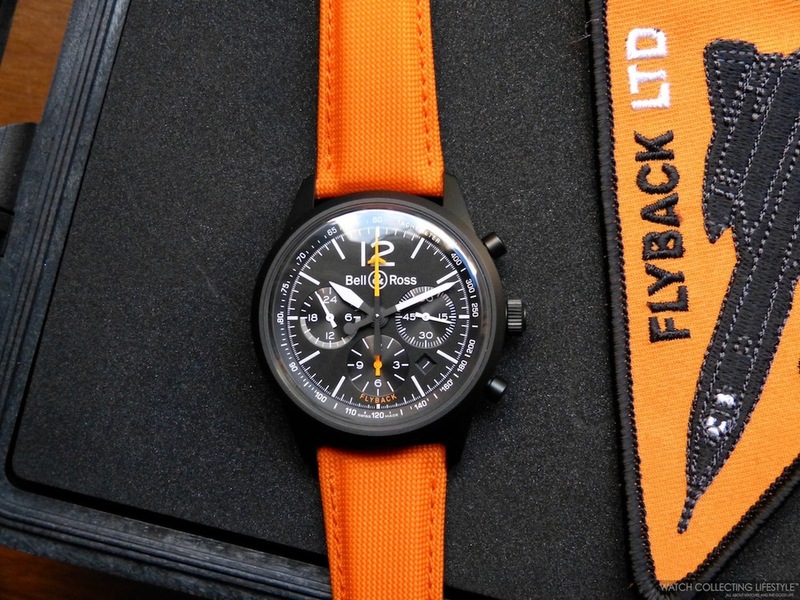 This watch is fitted with a stainless steel matte black PVD finished case measuring 43mm in diameter and equipped with a colorful bright orange heavy duty canvas strap lined with leather and fitted with a PVD pin buckle. The case is solid and well proportioned featuring a nice signed screw-down crown and chrono pump pushers that merely protrude on the case band. The case back is solid and properly engraved with the limited edition and depth rating —waterproof to a depth of 100 meters— information. The operation of the chronograph is nice and smooth when pressing the chrono pushers. This watch is an aviation chronograph designed according to professional specifications and equipped with an automatic Flyback mechanism. The watch features a matte black dial that is very well balanced featuring recessed running seconds register at 3, a 12-hour chrono-register at 6, a 24-hour indicator at 9 and a date aperture between 4 and 5 o'clock. 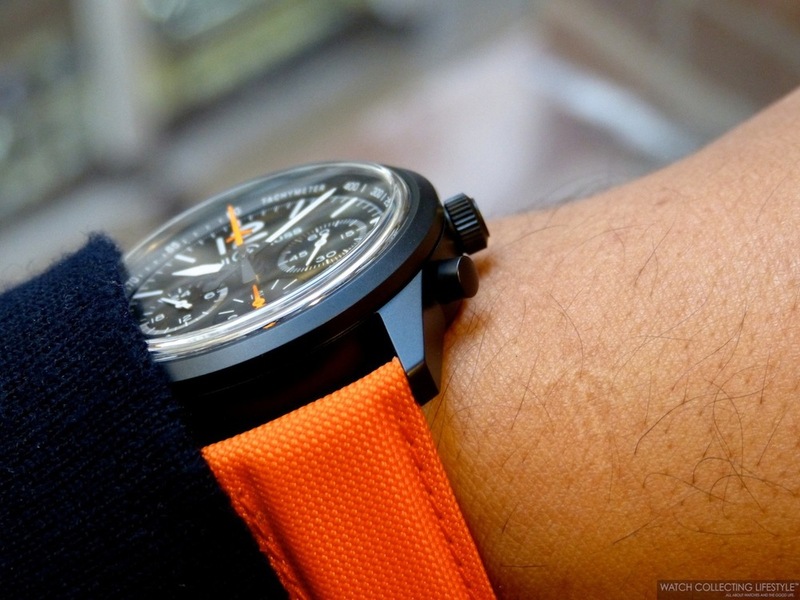 All chronograph hands are orange —matching the strap— for optimal readability while the hour and minute hands are black with white tips. The anti-reflective coated domed sapphire crystal provides excellent visibility under bright light conditions and the watch features luminescent material on the markers as well as on the hour and minute hands. On the wrist, the watch wears true to its size and very comfortably. While the movements inside Bell & Ross watches are not in-house calibres, we feel that the ETA calibres used are extremely reliable and great workhorses build to last a very long time. At the time we published this review, we have not received confirmation from Bell & Ross whether the beating heart inside this watch is a modified Lemania 1350 automatic calibre or an ETA movement with a Dubois & Dépraz module on it. Our best guess is that Bell & Ross decided to go with the ETA calibre instead of the Lemania. Sticker Price $6,700 USD. For more info on Bell & Ross click here. 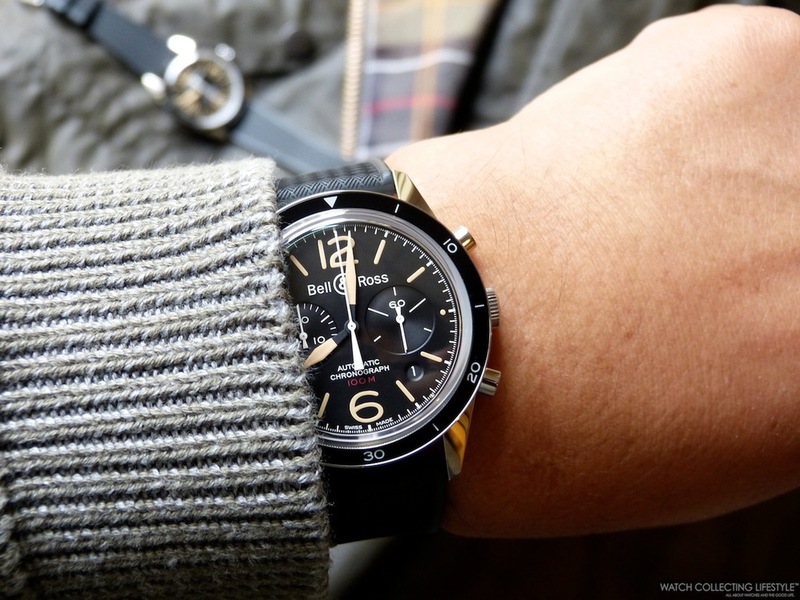 Posted on December 18, 2013 by Editor & Publisher and filed under Bell & Ross and tagged Bell & Ross Vintage BR126 Blackbird Bell & Ross BR 126 75 S Posts 2013.
Insider: Bell & Ross Sport Heritage BR 126 Chronograph and BR 123 Non-Chrono. Two Vintage Looking Watches Perfectly Executed and a Must Have. The latest addition to the Bell & Ross Vintage Collection are these two beautiful watches under review. The Sport Heritage BR 126 features a 30-minute chronograph while the Sport Heritage BR 123 is a non-chrono with date. These two watches pay special tribute to the 1960s, a period of intense creativity and numerous innovations including the creation of Dassault's famous Mystère-Falcon 20 —the best business jet of its time. These two fascinating timepieces not only look very vintage but also feel quite vintage as both are fitted with a perfectly executed tropic rubber strap with pin buckle that looks as if it was a new old stock strap from a previous era. For those of you concerned about the fit of the strap, this strap is very soft, malleable and comfortable. For those of you with smaller wrists, Bell & Ross offers three different sizes for a perfect fit. Both models are fitted with black matte dials with sand-colored luminova to give the appearance of a rich 'cafe con leche' patina on the hands, markers and Arabic numerals. To round up the vintage look of these watches, the dial also features a 100 meter depth rating writing in red. These dials are flawlessly executed and a real treat to the eyes. The Sport Heritage BR 126 Chrono features running seconds at 3, 30-minute chrono-register at 9 o'clock and date aperture between 4 and 5 o'clock. The non-chrono model BR 123 only features a date aperture between 4 and 5 o'clock. Both models are fitted with polished stainless steel cases measuring 41mm in diameter, fixed black bezels graduated to 60 minutes in increments of 10 minutes, ultra-rounded domed sapphire crystals and display case backs that allow for full view of the self-winding automatic calibres —the movement on the chronograph is slightly nicer than that on the non-chrono model. The crystals are treated with anti-reflective coating for improved visibility and the BR 126 Chrono features the traditional 'old school' pump pushers that are somewhat hard to push to activate the chronograph. Both watches are quite thick but still very comfortable. On the wrist, the watches wear extremely comfortably and slightly larger than their actual size —more like 42mm watches. The wrist presence is spectacular and definitely a conversation starter among watchlifestylers that appreciate vintage timepieces. At first glance, one would think these watches are new old stock 'safe queens' from the early 60s with the nicest and most even 'patina'. 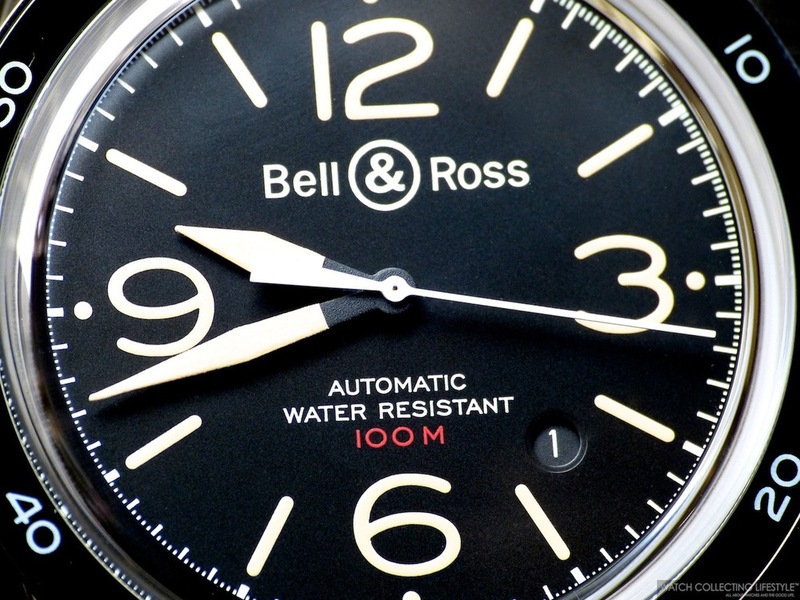 Upon close inspection the Bell & Ross logo is the tell tale of a modern timepiece with vintage character. Regardless, these two watches are really gorgeous and our two favorite Bell & Ross watches right now. 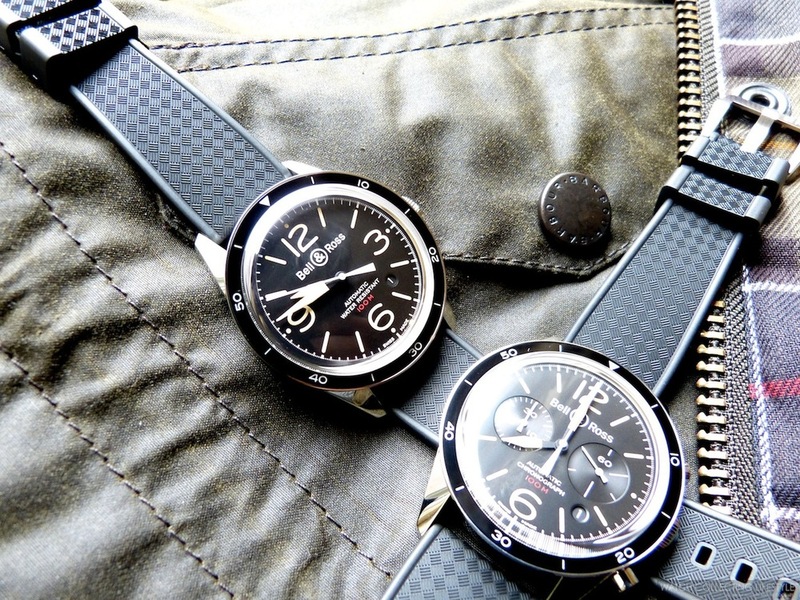 Next time you are wearing your Barbour jacket, make sure you pair it with one of these fascinating watches. Sticker Price BR 126 $4,500 USD. BR 123 $3,100 USD. For more info on Bell & Ross click here. Posted on October 30, 2013 by Editor & Publisher and filed under Bell & Ross and tagged Bell & Ross BR 126 Chronograph Bell & Ross BR 123 Non-Chrono Bell & Ross Sport Heritage BR 126 Bell & Ross Sport Heritage BR 123 Posts 2013.
Insider: Bell & Ross Horizon Limited Edition. Another Aircraft Instrument Inspired Timepiece. 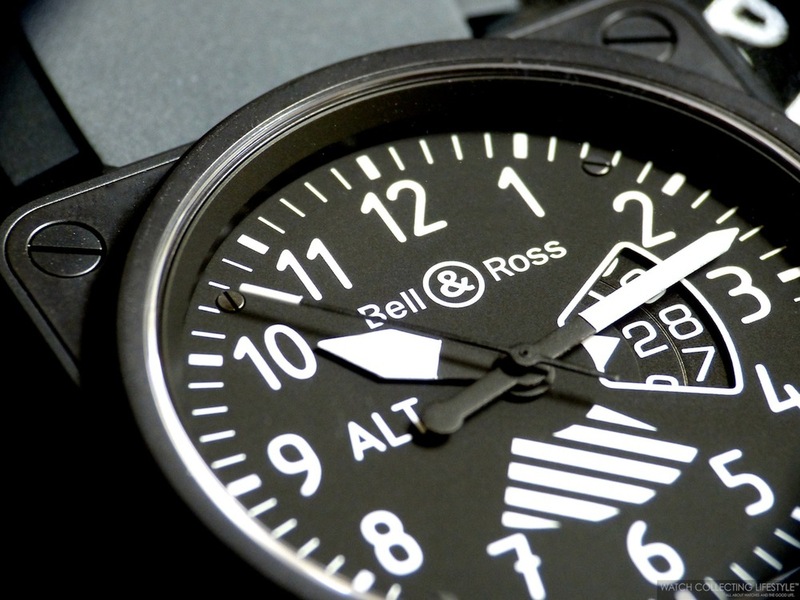 As you know, in the past we have featured other models of the Bell & Ross BR01 Flight Instruments collection here. This time we will be talking about the limited edition Bell & Ross Horizon, a very unique timepiece that was inspired by the artificial horizon instrument in aircraft cockpits. 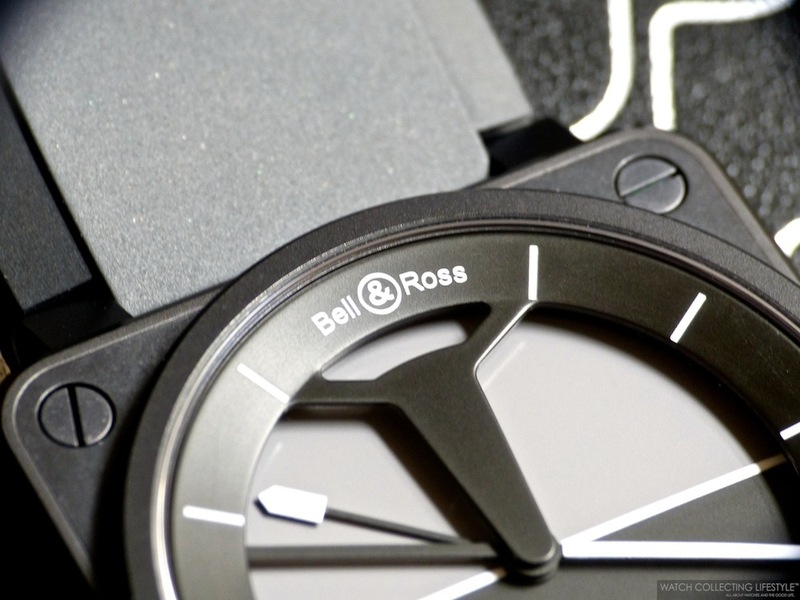 The Bell & Ross BR01 Horizon ref. BR0192-Horizon offers superb legibility in the legendary 46mm PVD black finished stainless steel case. This limited edition is only available in 999 pieces and is part of a six-watch set of flight instrument inspired watches that compose the Aviation Flight Instruments collection. The set includes the Horizon we are reviewing, the Turn Coordinator, the Altimeter, the Air Speed, the Heading Indicator and the Climb. The first 99 Flight Instrument watches were offered in a gorgeous collector's box containing all six references. The box is designed as a control panel where all watches appear to be inserted in the panel when the box is closed. The watch is fitted with a light gray and charcoal dial with white markers that perfectly resembles the artificial horizon flying instrument. In order to complete the resemblance even better, the watch only features hour and minute hands —no seconds hand is fitted. The hand for the hours is the thin black one with a white tip and the minute hand is an extra long hand that goes across the circumference of the dial. This minute hand is divided in two parts where the white part indicates the minutes on the dial. The BR01 Horizon is fitted with the traditional BR rubber strap with a PVD pin-buckle that is very comfortable, flexible and soft to the touch. Upon purchase, the watch also includes a second interchangeable nylon strap. The watch features an automatic movement, a screw-down crown, an anti-reflective coated sapphire crystal and waterproofing to 100 meters. As we've mentioned before, if you are in love with airplanes or you wanted to be a pilot but didn't make your dream come true, this watch will make you feel like you are inside the cockpit of a Beechcraft or a Cessna, flying the friendly skies. Sticker Price $5,000 USD. For more info on Bell & Ross click here. Posted on August 6, 2013 by Editor & Publisher and filed under Bell & Ross and tagged Bell & Ross BR01 Horizon Limited Edition Bell & Ross Flight Instruments Collection Price Bell & Ross BR01 Horizon Bell & Ross Horizon Limited Edition 999 Pieces Bell & Ross BR01 Horizon ref. BR0192-Horizon Posts 2013.
Insider: Bell & Ross BR01 Altimeter. Just Like an Instrument Removed From an Aircraft Cockpit. The Bell & Ross ref. BR01-96-SAlt Altimeter Limited Edition watch is part of the Flight Instruments BR01 46 mm Aviation collection launched in 2012. The Altimeter, like the other four models in the collection, is only available in a limited number of 999 pieces. Inspired by the altimeter instrument in aircraft cockpits, the BR01 Altimeter offers unparalleled readability and a very unique look with the iconic square Bell & Ross case. This Bell & Ross watch has a matte black PVD finished stainless steel case measuring 46 mm wide, a large date aperture between 2 and 4 o'clock —the date is composed of two rotating discs— a screw-down crown, water resistance to 100 meters and a soft rubber strap with a pin buckle. The watch also comes with an interchangeable heavy-duty synthetic fabric strap. The movement in this timepiece is the calibre ETA 2896 with a power-reserve of approximately 48 hours. The dial is matte and the letters ALT and the grooved indicator are printed in a way where they closely resemble the aircraft cockpit instrument. The hands and markers are covered in a white photo-luminescent coating that creates the perfect contrast with the black dial. The anti-reflective, matte black carbon finish of the case is inspired by the color of an aircraft instruments panel, designed to make the dials easier to read by eliminating reflections. Additionally, the watch is also fitted with an anti-reflective sapphire crystal. The case, just as on all other models from the BR01 collection, comes with four 1.3 mm hex key screws on the case back along with the traditional flat head 'Do Not Unscrew' screw and four flat head screws on the front of the case. The strap is also secured to the case by hex key screws and the case back is engraved with the Limited Edition information. 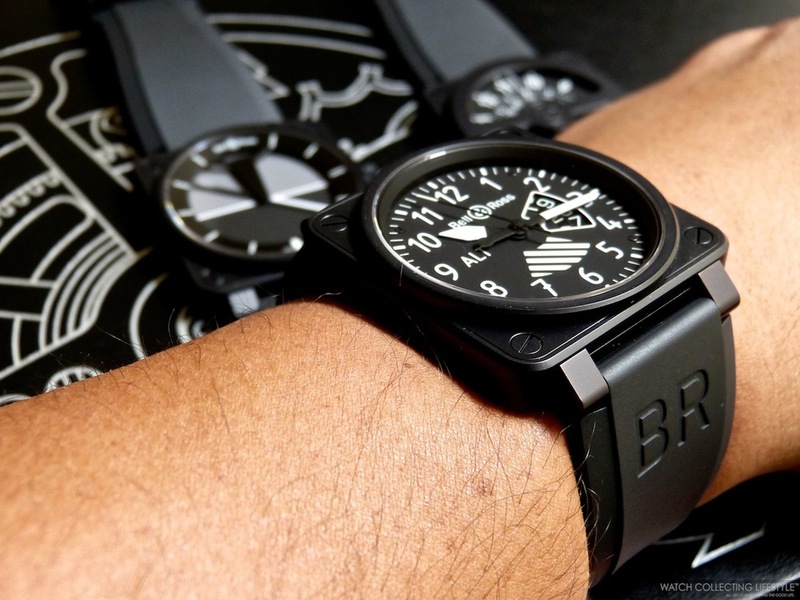 If you love everything that has to do with aircrafts or if your lifetime dream was to be an airline pilot but you ended up working in advertising, then the BR01 Altimeter is a must have in your collection. This beautiful watch is a rugged timepiece with nice wrist presence and a very unique look. Sticker price only $4,500 USD. If you are ready to buy or you are just looking for more info click here. Posted on July 3, 2013 by Editor & Publisher and filed under Bell & Ross and tagged Bell & Ross BR01 Altimeter Bell & Ross ref. BR01-96-SAlt Altimeter Limited Ed BR01 96 46mm Bell & Ross Limited Edition Bell & Ross Altimeter BR01-96-SAlt BR0196-ALTIMETER Posts 2013.
Insider: Bell & Ross BR02-94 Carbon. A Great Looking Diver's Chronograph. Nothing like nice watches and fast cars. 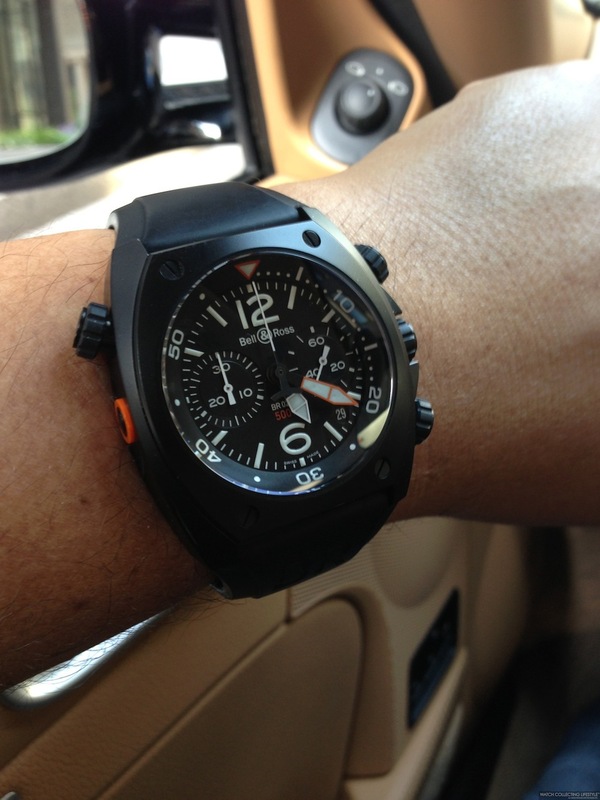 Yesterday, while driving around the city we decided to work on a quick review of the Bell & Ross Marine BR02-94 Carbon Chronograph. 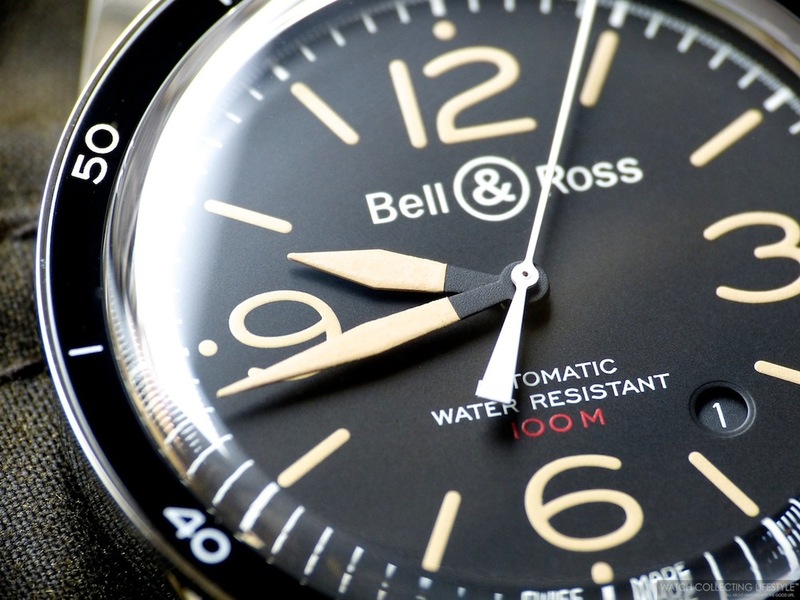 In our opinion, one of the best looking Bell & Ross watches out there. This sporty watch, comes with a massive black PVD case measuring 44 mm and provides outstanding wrist presence. This Diver's Chronograph, was a great addition to the Bell & Ross BR02 Marine line of watches several years ago. The watch is fitted with an inner elapsed times bezel that can be rotated via the crown at 10 o'clock. However, the crown needs to be unscrewed to rotate the bezel and screwed back in before immersion in water. The bezel is graduated and toothed to 60 minutes and rotates very smoothly with a nice clicking sound. All crowns and pushers are fitted with a rubber ring to facilitate their operation while wearing diver gloves or in case the watch is wet. The chronograph pushers just like the crown at 10 o'clock, need to be unscrewed in order to operate the 30-minute decompression chrono. The pushers need to be pressed hard in order to start, stop or reset the chrono function. 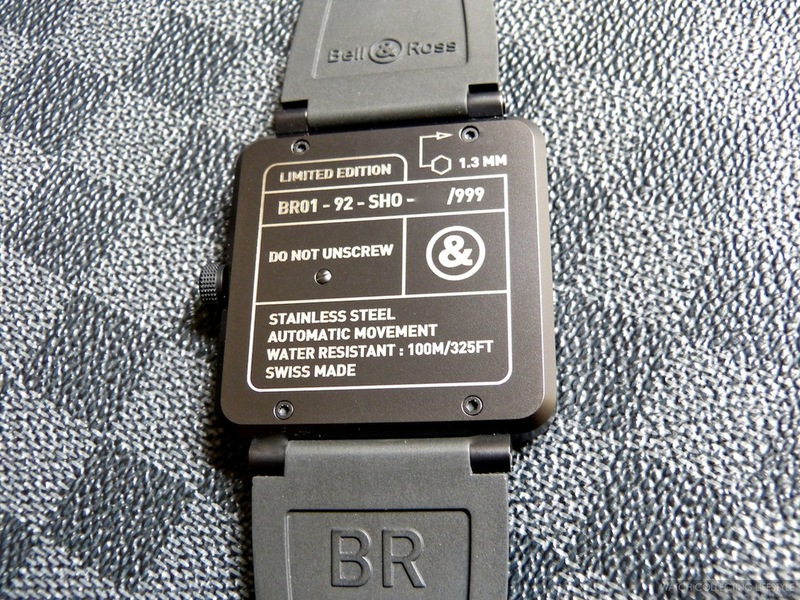 The BR02-94 comes with a very soft and comfortable rubber strap with a PVD pin buckle in addition to a nylon strap that is also included inside the pelican box that comes with the watch. The case back is very solid, does not protrude too much and it's marked with the iconic Bell & Rolls logo '&'. The anti-reflective coated sapphire crystal is very thick in order to withstand the pressure of its depth rating—500m/1,500 ft— and the watch is also fitted with a decompression valve on the side of the case at the 9 o'clock position. The decompression valve is necessary when using a decompression chamber. Overall, the watch is very nice and the luminescent material on the dial and bezel provides a blue glow that is bright and long lasting. The matte dial is nicely finished with recessed registers at 3 and 9 o'clock —running seconds at 3 and 30-minute chrono at 9. The minute hand comes with an orange border that eases its readability underwater and provides a nice contrasting touch of color. This 30-minute chronograph, is a true diver's watch and definitely a great timepiece to wear this summer. If you find one, grab it as they are becoming more scarce. 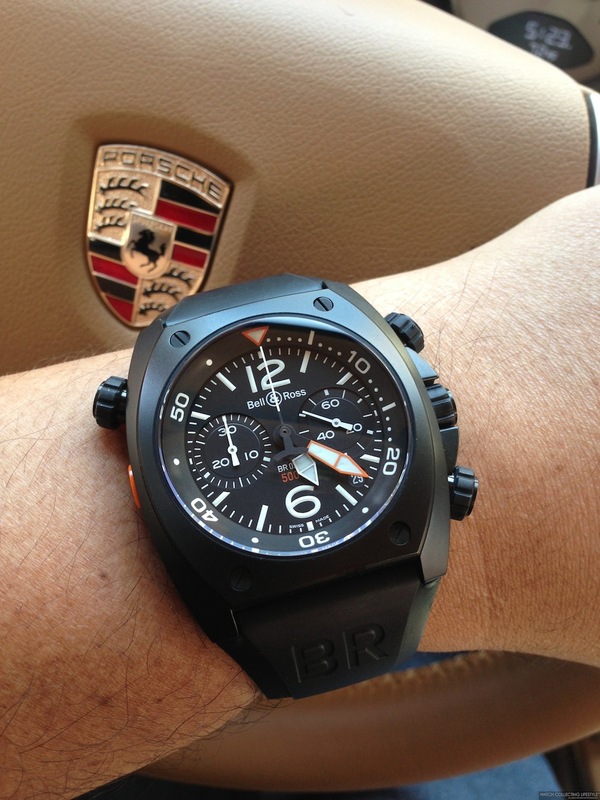 The BR02-94 Carbon is also available in stainless steel and in a combination of PVD with rose gold. Sticker price for the Carbon one $5,900. Posted on May 31, 2013 by Editor & Publisher and filed under Bell & Ross and tagged Bell & Ross BR02-94 Bell & Ross Diver's Chronograph Vacuum Carbon Finish Bell & Ross PVD Watch Bell & Ross BR02-94 Carbon Bell & Ross Marine Posts 2013.
Insider: Bell & Ross Space 2. The Re-encounter with an Old Friend. Back in the year 2000, our watchlifestyler friend Juan Carlos sold this Bell & Ross Space 2 to one of his fellow friends and work colleagues, who happens to also be a watchlifestyler. The deal took place in Mexico City. Juan Carlos mentions that he still remembers the deal as if it had taken place yesterday and also how much he had missed this watch after departing his collection. Juan Carlos and his friend Memo didn't stay much in touch after they both have moved back to the U.S. Last year, Memo decided to take a job in Chicago where Juan Carlos is now residing. They had reconnected since then and a couple of weeks ago they decided to meet up for a few drinks and finally catch up properly regarding the watch. Memo brought the watch over to dinner and left if with Juan Carlos so that we could properly review it and picture it. This Bell & Ross is now a very hard to find piece. If you find one is very likely that it will be in terrible abused condition. Fortunately, this one has held up nicely and is starting to show some nice light cream patina on the dial markers. Long gone are the days of the Bell & Ross watches designed and manufactured by Sinn, the German company. This chronograph houses a Lemania 5100 caliber which is a true chronograph movement and not just a chrono module. This watch comes with day and date indicators, military 24-hr time register at 12 o'clock and a power-reserve of 45 hours. The chrono minutes and seconds are located on the central pinion opposed to registers on the dial. The running seconds are at 9 o'clock, while the chrono 12-hour register is located at 6 o'clock. The stainless steel case and bracelet are bead-blasted to offer extra durability and scratch protection, the watch is waterproof to a depth of 200m/600ft, fitted with a flip-lock clasp, flight-suit extension, and a anti-glare double-coated sapphire crystal with a somewhat redish tint to it. In our opinion, this watch has one of the best anti-glare coatings we've ever seen during our collecting life. Another interesting characteristic of this watch—and that Mr. H didn't remember up until the re-encounter— is that the case is also anti-magnetic. Below you will find some of the shots taken at the time Memo picked up Juan Carlos on his Porsche Cayenne Turbo. They had a few drinks and food at the JW Marriot and here are some nigh shots of the occasion. At 40.3 mm, a weight of approximately 155 grams and somewhere in the $3,500-4,500 price range —depending on condition—, this collector's timepiece is one that you cannot pass on if you ever come across one that is up for sale. Here are the shots taken the next day. Now you can really appreciate the watch and its beauty. If you find one, give us a call and we'll let Juan Carlos know as Memo won't sell back this one. Sticker Price $3,500-4,500 USD. For more info on Bell & Ross click here. Posted on April 2, 2013 by Editor & Publisher and filed under Bell & Ross and tagged Bell & Ross Space 2 Discontinued Bell & Ross Posts 2013.